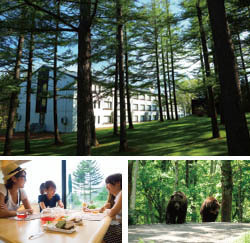 Introducing a hotel with a forest and a garden along the Hokkaido Garden Road. 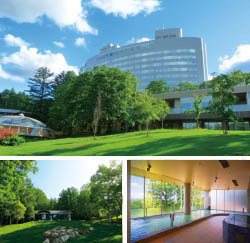 It is a hotel full of services and gimmicks that makes staying in Asahikawa even more enjoyable. The information of the seasonal charm unique to the locals experienced by the staff is disseminated in the neighborhood map set up in the lobby. 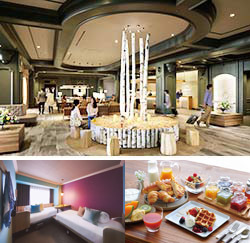 Please enjoy the breakfast buffet, which boasts of freshly baked waffles, the next morning enjoying the town. Ueno Farm Gardener Supervised by Ueno Sand Yuki's garden lunch is a colorful chef lunch that studies "Hokkaido-likeness" everywhere. Ueno Farm Gardenia Ueno It is a colorful chef lunch that studied "Hokkaido - likeness" everywhere, supervised by Yuki Ueno. Mt. Taisetsu mountain peak called Kamui Mintara "Gods playing the gods". The mountains around Sounkyo Gorge are a "sky garden" where many alpine plants bloom in early summer. Scenery cliffs and original forest weave, clear air gently wrap you in nature. 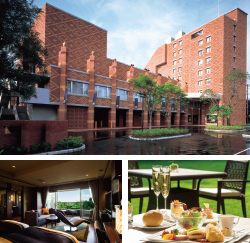 Hotel Ohtsuki is the tallest building and you can feel the nature nearby from the large public baths with different taste of 3 places. 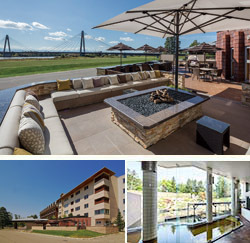 A resort hotel embraced by a beautiful forest and majestic mountains. The natural phenomenon created by the rich environment sometimes turns into an "illusional landscape" that has never happened before. Facilities scattered around a vast site, you can enjoy a wide range of activities, and with a fulfilling hot spring · relaxation it will gently heal your mental and physical fatigue. Please come to the rich field where you spend in a refreshing season. A resort hotel surrounded by woods and wrapped in the warmth of wood. "Hanamori Bear Cafe Restaurant" where you can taste the special cuisine and sweets, mainly of Hokkaido ingredients including Tokachi. 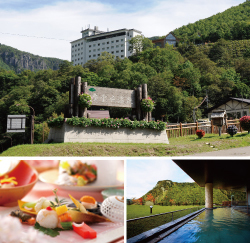 It is the real pleasure of Tokachi Sahoro Resort's trip that you can taste the original landscape of Hokkaido where many people can imagine, such as 'Bear Mountain' where you can meet the elephant brown bear representing Hokkaido. Brick city resort hotel built in a corner of the city. Rooms offering a magnificent view of the Hidaka mountain range and the lush courtyard, various rooms with different taste such as a terrace and a hot spring outdoor bath are prepared. A mall hot spring containing a lot of vegetable organic ingredients that springs from the source in the site, and a courtyard that occasionally shows cute ezolith and wild birds. Please enjoy the resort feeling slowly while staying in the city. Vibrant lunch with tasteful ingredients of the earthly graceful ingredients, including appetizers that imagined the vast vegetable fields of Tokachi, prepared for course dishes. The hotel maid bread of Tokachi wheat 100% is also attractive. Hokkaido heritage that moisturizes the heart and skin "Mall hot spring"
The spa suite Toyosujitei with outdoor bath in all rooms, and 2 hall of casual soyoyotei in Japanese modern style, it is a magnificent scenery where you can see the mountain ranges of the Tokachikawa and Hidaka mountain ranges that flow calmly. Worldwide rare botanical 【Mall hot spring】 contains abundant moisturizing ingredients, reputed to make the skin of the hot water slippery 【beautiful hot water】. Please enjoy relaxing mall hot springs with two different outdoor baths of two kinds of outdoor baths and garden outdoor baths.